London Bridge station is a central London railway terminus and connected London Underground station in Southwark, occupying a large area on two levels immediately south-east of London Bridge and 1.6 miles (2.6 km) east of Charing Cross. The mainline station, which is the oldest railway station in London fare zone 1 and one of the oldest in the World having opened in 1836, contains nine terminal platforms and six through-platforms for services from the south and south-east of London. Through services continue to Charing Cross, Cannon Street or Blackfriars. In terms of passenger arrivals and departures it is the fourth-busiest station in London as well as the United Kingdom as a whole, handling over 54 million customers a year. (These statistics do not include the many commuters who transfer between lines at the station.) 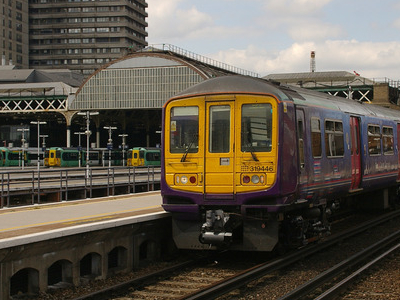 London Bridge is served by Thameslink trains running between Bedford and Brighton as well as Southeastern services from Charing Cross or Cannon Street to destinations in southeast London, Kent and East Sussex. It is also the terminus for Southern commuter and regional services to south London and numerous destinations in South East England. The mainline station is one of 19 UK stations managed by Network Rail. The Underground station is served by the Jubilee line and the Bank branch of the Northern line. It consists of a ticket hall and entrance area with its main frontage on Tooley Street, along with entrances on Borough High Street, as well as within the mainline station concourse and a corridor under the through-platforms (currently 1-6). The station is in fare zone 1. London Bridge is one of two mainline termini in London to the south of The River Thames, the other being Waterloo. For this reason, neither has a direct connection to the Circle line. Here's the our members favorite photos of "Railway Stations near London Borough of Southwark". Upload your photo of London Bridge Station!